Frederick Lee portrait painted by Tadeusz Kosciuszko. Only illustration of a cutter captain known to exist. Courtesy of Henry Whitfield State Museum, Guilford, CT.
Born and raised in the Neck River area of East Guilford, Frederick Lee spent much of his life aboard ships and far from home. He was a master of sloops, schooners, and brigs, many of which were built in Madison for use in the coastal trade. 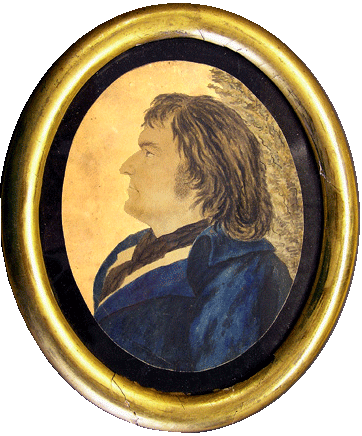 In 1797, while he was still a private merchantman, he carried aboard his vessel, the Adriana, the brilliant Polish military hero and engineer Thaddeus Kosciusko, who was returning from London to the United States for a post-Revolutionary tour. In 1809, Lee, then 43 years old, was commissioned by President James Madison to serve as a master in the US Revenue Cutter Service, a predecessor to the US Coast Guard. Lee's newly inaugurated 130-ton schooner Eagle II was fitted with a crew of twenty-five men and six cannon. Organized under President Washington to collect taxes on goods that were carried into United States ports, the Revenue Cutter Service was also responsible for defending American vessels against the piracy of foreign interests. 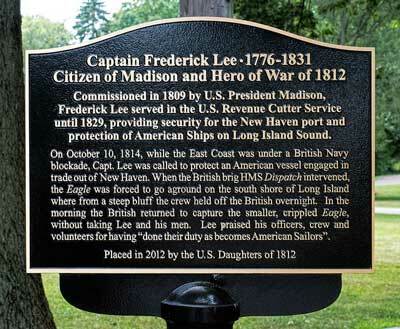 Two years into the War of 1812, while most of the East Coast was under a British Navy blockade, Captain Lee and his crew went to the rescue of an American merchant ship sailing out of New Haven. 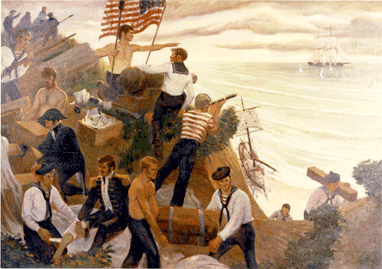 The opposing British brig forced Lee and his crew to beach their cutter. Lee and his men took a position at the top of a bluff on Long Island and exchanged musket and cannon fire with the British throughout the day and night. Unable to force Lee and his men off the bluff, the British took the Eagle. Nevertheless, the unstinting efforts of Captain Lee and his crew were applauded, and the story was reported in newspapers around the country, bringing fame to the Eagle's crew. After the war ended, Lee served in the cutter service for another fifteen years as the master of a newly built Eagle. He resigned in 1829 at the age of sixty-three. Within one year, he was serving in the Connecticut State legislature as one of New Haven County's representatives. Lee was affiliated with many civic projects that were of benefit to the town. Among these were the development of the Durham-East Guilford Turnpike and the West Wharf. Perhaps the grandest of his achievements on behalf of his fellow citizens was the establishment, in 1826, of Madison as an independent town. Lee died in 1831 at the age of sixty-five. He left behind a rich legacy of ideals and projects that contributed to the betterment of the town of Madison.